Thanks, both workarounds work great. Damned M$, how many years to correct a bug…? 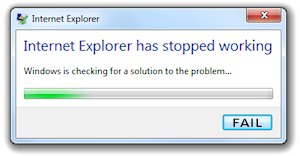 I had the same problem, IE11 crashed on my dropdown select boxes sporadically. In my case, a dropdown select box can’t be the only item in an html table, it must stay with other elements like multiple or multiple . I don’t have a size attribute and an onchange event. This post was a life-saver. I just used setTimeout and it worked great. I was pulling my hair out and trying to meet a deadline… awesome post.